The fourth round of the 2016 Rotax Pro Tour National Series marks the mid-point of the season, thus bringing about an increased focus on attaining rankings points with the critical top three positions all within striking distance by multiple drivers at Ipswich. It now remains to be seen who can claim the all important podium results and maximum round points in the second visit to Queensland for the year. 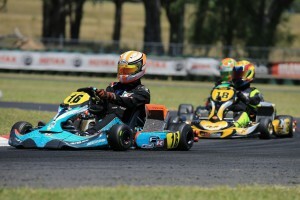 New Zealand’s Emerson Vincent continues to hold a slender points lead in Micro Max over Sebastian Ruiz and with the Rotax Grand Finals seat on offer for the overall winner, there exists increased competition amongst the youngest drivers in the series as the second half of the season begins. James Wharton and Kai Allen are within 400 points of each other at the top of the Mini Max series order. Entering the Ipswich event, they are seen to be the two key favourites to take maximum points from the weekend. A driver to watch is Jack Westbury who sits fifth in the standings. The Queenslander is back on home soil and continues to be a consistent performer in his first season in the class and will be a key challenger to both Wharton and Allen across the weekend. The recent success of Brodie Whitmore in Junior Max Trophy has helped him to open up the second largest margin of any of the drivers in first and second in the points overall. Whitmore leads over Tasmanian Callum Bishop and Kiwi Samuel Wright. Jaiden Pope, in his first season in Junior Max Trophy, will be another driver to watch being the reigning State Champion in Mini Max having achieved success at Ipswich in 2015. 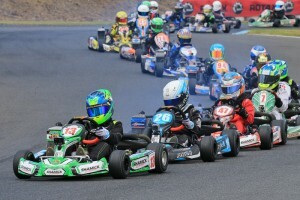 Victorian Dylan Hollis holds a commanding lead in the Junior Max points and as such will enter this weekend as one of the key favourites, however the competition and evenness within the Junior Max class exists as a marquee feature of the category, hence the composition of the podium come Sunday afternoon is difficult to predict. Nathan Herne who is second in the points, is on home soil at Ipswich and will be hoping to extend his 200 point buffer on third placed driver Cody Brewczynski. The Sydney driver comes into the weekend on the back of a successful debut in New Zealand in Junior Max since the last round at Eastern Creek. Just 700 points separate second through to fifth in the Junior Max points order ahead of this weekend, thus it exists as a critical part of the seven round season. 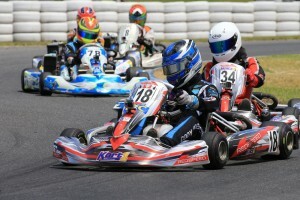 Team mates Joshua Fife and Cody Gillis are neck and neck in the series points order in Rotax 125 Light. The pair have been amongst the drivers to chase all three of the opening rounds with Gillis taking the round wins at both Todd Road and Warwick. Since his return to the Pro Tour, Pierce Lehane has quickly joined the winners circle and will as such be a favourite for the weekend, along with Brad Jenner who took the round win at Eastern Creek and Nicholas Andrews who is a known strong performer at Ipswich. Since returning to Rotax 125 Heavy, Chris Farkas has delivered the dominant performances that helped him claim the 2015 Rotax MAX Australian Challenge Series win in the class. Benjamin Ritchie holds the series lead coming into the event by just over 100 points ahead of Clem O’Mara with Shay Mayes in third. All four drivers are well within the running to claim the victory, as is Lane Moore who makes a chassis switch for this weekend’s event. Moore sits a close fourth in the points standings coming into this weekend. Victorian pairing Troy Woolston and Adam Lindstrom have less than 300 points separating them at the top of the order in DD2 entering the Ipswich event and have as such been the standout performers through the first three rounds of 2016. Queensland’s Ryan Kennedy will be a driver to watch at his home track which will also be his second event since making a chassis switch, while Joshua Car will come into the event buoyed with confidence after taking a clean sweep last time out at Eastern Creek in only his third meeting in DD2. Leigh Nicolau, a driver with a wealth of experience in Karting who has also featured within the Australian V8 Ute Racing Series, will step up to make his DD2 debut this weekend. Lee Mitchener has been the standout consistent performer in DD2 Masters so far in the 2016 season, holding a Championship lead over Scott Howard of 1,000 points. For Howard, it will be a home event and as such will act as a prime opportunity to narrow the lead of Mitchener. After being absent from Eastern Creek due to V8 Ute commitments, Kris Walton returns, at his home track and will be looking to climb his way back up the points order after slipping to fifth due to his absence. Round 4 of the 2016 Rotax Pro Tour takes place at the Ipswich Kart Circuit, Queensland from 3-5 June.